Abkhazia and South Ossetia are two disputed regions in the Caucasus with de facto independence as the Republic of Abkhazia and the Republic of South Ossetia, respectively. The two republics each claim to be sovereign states deserving of full international recognition and recognise each other as independent states. Georgia, however, rejects the legitimacy of the two republics and considers both Abkhazia and South Ossetia to be occupied territory that, de jure, remains part of Georgia. Four UN Members (Russia, Nicaragua, Venezuela and Nauru) recognise Abkhazia and South Ossetia as independent states. They are also recognised by Transnistria, a state that is unrecognised by all UN members. 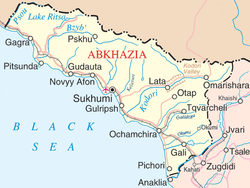 The status of Abkhazia is a central issue of the Georgian–Abkhazian conflict. The wider region formed part of the Soviet Union until 1991. As the Soviet Union began to disintegrate towards the end of the 1980s, ethnic tensions grew between Abkhaz and Georgians over Georgia's moves towards independence. This led to the 1992–1993 War in Abkhazia that resulted in a Georgian military defeat, de facto independence of Abkhazia and the mass exodus and ethnic cleansing of the Georgian population from Abkhazia. In spite of the 1994 ceasefire agreement, and years of negotiations the status dispute has not been resolved, and despite the long-term presence of a United Nations monitoring force and a Russian-dominated CIS peacekeeping operation, the conflict has again flared up on several occasions. In August 2008, the sides again fought during the South Ossetia war, which was followed by the formal recognition of Abkhazia by Russia, the annulment of the 1994 cease fire agreement and the termination of the UN and CIS missions. In the wake of the 2008 South Ossetia War, Nicaragua, Russia, Venezuela and Nauru recognized South Ossetia as an independent republic. 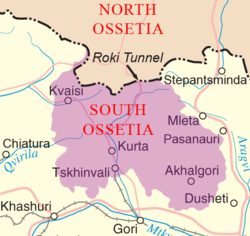 Georgia does not recognize South Ossetia's existence as a political entity, and considers most of its territory a part of the Shida Kartli region within Georgian sovereign territory.